There are several roles that a dialysis technician must play. They have multiple roles that help dialysis patients whenever they receive dialysis treatment in any dialysis center. These people have fixed roles and responsibilities, which they need to carry out with great efficiency so that no patient comes under any kind of harm because of their own negligence. The most important role of a dialysis technician is the fact that they are the primary caregiver of the patients who are undergoing any type of dialysis treatment at a center. They are responsible for the direct care of the patient receiving the dialysis treatment. They work in close proximity with the patients and with the doctors and nurses at the center or at the hospital. They are basically supervised by registered nurses or doctors, or other important personnel of the patient care team in the hospital or the dialysis center. These dialysis technicians have to be knowledgeable and competent regarding all the scientific principles of dialysis, as well as the physical and emotional needs of the patient that they are attending to. They need to learn about every single step of the process and they must know how to respond to a problem in a way that satisfies the expectations of the patient who is undergoing dialysis treatment. A certified dialysis technician will always know what to do in every kind of situation. He or she will know what needs to be done at what time, and they will also be aware of exactly how they need to respond to anything if it goes wrong. What Are The Duties You Are Expected to Carry Out? 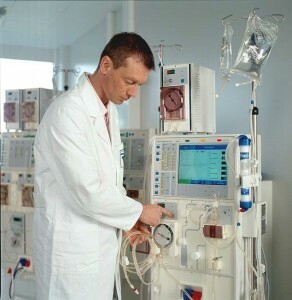 There are several duties and tasks that a dialysis technician is expected to carry out. They are supposed to assemble the supplies in the center. They are also expected to be in direct contact with the patient when he or she is receiving treatment. Another duty of dialysis technicians is to verify the absence of residual sterile components. Prepare the sugar solution called dialysate, according to the procedure that is highlighted by professionals or the dialysis prescription. Test the machines and the monitors to see if they are functioning properly or not. The preparation of the dialysis extracorporeal circuit and make sure that it falls in accordance with the dialysis prescription and the necessary protocol that it has to follow. Get hold of the pre-dialysis specifications, which are inclusive of the weight of the patient, the temperature of the patient, and the other vital signs of the patient. Document the pre-dialysis specifications, which are inclusive of the weight of the patient, the temperature of the patient, and the other vital signs of the patient. Make sure that the temperature, the conductivity, and the alarms of all the equipment are working in a proper manner. Set the alarm and the monitors so that they are in accordance with the manufacturer’s own directions. Measure the blood flow rates of the patient who is about to undergo the dialysis, as it has been prescribed and directed to them. This should be in perfect accordance with the already-established protocols of the dialysis treatment procedure. If the need arises, adjust the blood flow rates of the patient who is about to undergo the dialysis, as it has been prescribed and directed to them. This should be in perfect accordance with the already-established protocols of the dialysis treatment procedure. Make sure to calculate the fluid removal rates of the patient and make sure that they are in accordance with the prescribed and established protocols that were already given to them. If the need arises, adjust the fluid removal rates of the patient and make sure that they are in accordance with the prescribed and established protocols already given to them. Being a dialysis technician automatically gives you a lot of responsibility, which is why you should first gain as much knowledge as possible concerning the duties of a Dialysis Technician and receive suitable technical training in this particular field.